ATM maker Diebold says it has met the tender condition for Wincor Nixdorf shares as part of a $1.8-billion acquisition. Last year, US-based Diebold agreed to buy out its German rival. The deal will see the creation of an ATM titan worth about $5 billion in sales and give Diebold a stronger presence in Europe. Based on preliminary information received from Clearstream, an international settlement and custody organisation, Diebold says it has reached 68.9% of Wincor Nixdorf shares for purposes of satisfying the minimum tender condition of the proposed offer. Diebold says on this basis, and subject to final verification, the voluntary public takeover offer for all no-par value bearer shares of Wincor Nixdorf has “succeeded” in reaching the minimum acceptance rate of 67.6% of all existing Wincor Nixdorf shares (including treasury shares). Diebold expects to publish the final results of the acceptance period today (29 March). The offer remains subject to regulatory approval and is targeted to close in the summer of 2016. According to the German Securities Acquisition and Takeover Act (WpÜG), shareholders of Wincor Nixdorf who have not tendered their shares can still accept the offer by tendering their shares during the additional acceptance period, which is expected to begin on 30 March and to end on 12 April. The market share of the combined company, to be called Diebold Nixdorf, will be about 35%. NCR Corporation will be its nearest rival, and has around 25%. 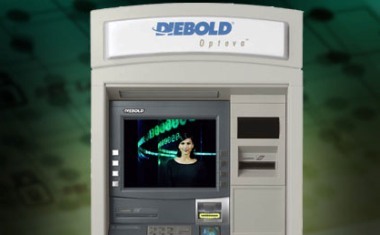 After a decade of being the ATM maker you’ve never heard of, Diebold is returning to Europe and a year into his tenure as president and chief executive at the firm, Andy Mattes thinks that the company’s profile is about to change. Following the ruling of the UK’s Competitions and Markets Authority (CMA), Diebold Nixdorf has shed some of its business. Diebold UK & Ireland has been sold to Cennox. ATM maker Diebold has unveiled a new concept banking platform with four “experience zones” at the Money2020 conference in Las Vegas. The concept aims to demonstrate how banks can combine convenience, security and self-service with a low cost ‘footprint’.